Universal tripod for any monopod with 1/4″ screw port at the bottom to stand alone. It is durable and sturdy, holds monopod on top securely. 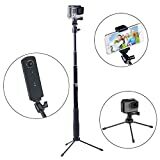 The combination of camera selfie stick +tripod stand enables you to record photo and video for hours with minimum effort. This professional design bring you a relaxed shooting environment. Flexible ball head mount for 360 degree rotation with the fast locking system easily to be adjusted to your desired angle, tilt. It is a nice camera mounting! This entry was posted in Discount Photography and tagged 5/4/3+/3/2/1/Session, Cameras, Cell, Compact, GoPro, Hero, Phones, Pole, Selfie, SmaPole, Smatree, Stand, Stick, Telescoping, Tripod by Ball Photo. Bookmark the permalink.